Summary: Erickson Consulting Engineers, Inc. (ECE) contracted with Sarasota County from 2004 to 2009 to conduct all coastal, civil, and geotechnical engineering services required to plan, design public communications, and provide Federal and state permitting for construction of a project to reopen Midnight Pass, closed since1983. 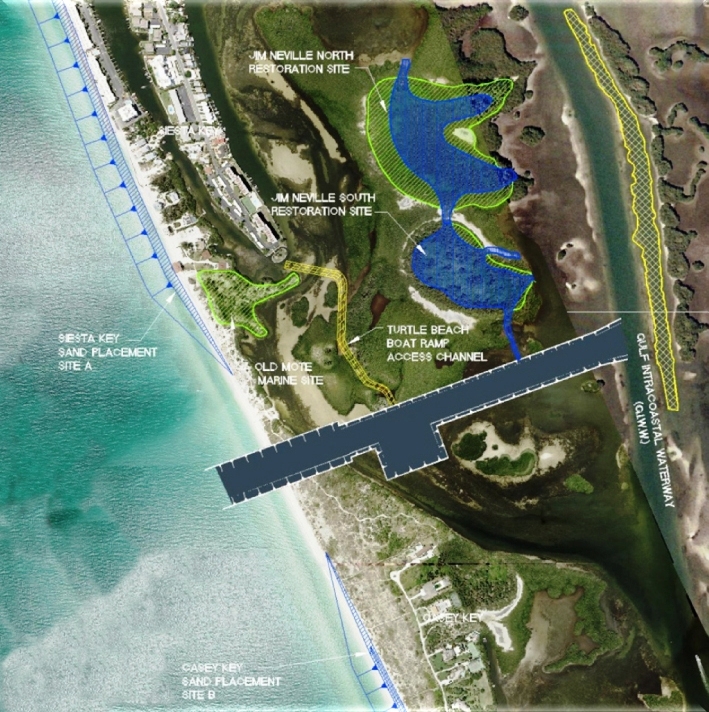 Benefits of the Midnight Pass Reopening Project include restoring tidal flows and improve water quality within Little Sarasota Bay, creating a productive marine environment, providing sand for beach nourishment, and stabilizing the adjacent beaches. In addition to creating recreational opportunities for boaters and fisherman, returning seagrass habitat to spoil islands that surround the Pass was a priority. The plans and design for the Pass reopening project consisted of excavating 525,000 cubic yards for placement along 16,000 ft of eroding beaches. Excavation included removal of 250,000 cubic yards from the reopened Midnight Pass channel, 110,000 cubic yards from the sedimentation basin, and 165,000 cubic yards from Turtle Beach Access Channel and the adjacent two spoil islands. Challenges: The project required placement of high-quality beach sand and separation of mixed sediments along 700 ft of the 3000 ft channel; large-scale restoration of interior spoil islands, and removal of exotic species in seagrass beds (58 acres). Schedule/Budget: The project budget increased in response to additional work required by FDEP and the schedule was as expected. The residents strongly supported the project - with the project on hold pending the outcome of litigation.